(...) While most historic heroes were maintained throughoutthe long period of Estado Novo and their deeds narrated accordingto the established ideology, the case of Viriato presents anexception. Viriato’s ascension to a heroic status had resultedfrom his struggle against the expanding Roman Empire and itsarmies. He had been defined as the ancestor of the Portuguesenation and our claim to the denomination “Lusos” (i.e., theheirs of the Lusitanians). This national and ethnic identificationparallels France’s identification with the Gauls and England’swith the Britons (DIETLER, 1994), while mapping Portugueseidentity and nation back to a time when it did not exist (in thiscase, 2nd century B.C.). Viriato was described in textbooks as a“barbarian,” a lonely shepherd who lived simply, and lovedfreedom. 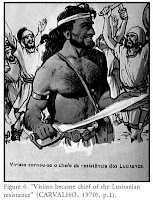 The iconography represented him as a strong, savage,bearded man, wearing skins, holding a small shield and a shortspear (in clear opposition to Roman weaponry – FABIÃO,GUERRA, 1997). As a rebel he led the Lusitanians through aseries of victories against the powerful Roman army, he wasdefeated only by treason. But after the beginning of the wars ofindependence in the African colonies, in 1961,Viriato became aninconvenient ancestor and was relegated to a secondary plan, almostcompletely disappearing from school textbooks with the rareexceptions as it is the case history textbook, published in 1968-1970, which has suggestive title of Lições de História Pátria, or“Lessons of Patriotic History,”). Through his defense ofindependence and use of less orthodox means to fight Roman armies, he could easily be identified with the rebel armies fighting for thefreedom of their countries in the African colonies, while thePortuguese colonial state could be compared to the invading Romans.